Greek: Eptesicus - "able to fly." Latin: fuscus - "brown." Fur: Uniform brown above. lighter below; hair-blackish base, brown tip. Ears: Broad, rounded tips; naked. Tragus: Clearly less than one-half ear length; blunt tip; curved forward. Total length: 93-134 mm. Forearm: 42-51 mm. Wingspan: 325-350 mm. Total weight: 13-25 g.
Dental formula: 32 total; I 2/3, C 1/1, P 1/2, M 3/3. Evening bat (N. humeralis): Smaller size «10 g) and shorter forearm «40 mm). All species of Myotis: Size smaller (>10 g) and shorter forearm «42 mm); tragus about one-half length of ear and straight. Overall: Throughout North America from mid-Canada to northern South America. Iowa: Statewide in both summer and winter. The big brown bat is not only the most widely distributed species in Iowa, but also roosts in the greatest variety of places, both natural and human-made. It is this species that most commonly associates with humans in Iowa. In the summer, females establish maternity colonies of 50 to 1,000+ in both artificial and natural sites, such as buildings, bridges, road culverts, storm sewers, mines, caves, tree cavities and loose tree bark. 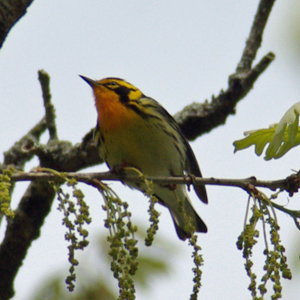 Adult males and non-reproductive females roost singly or in small groups in similar places, but usually away from nurseries. They often have alternate day and night roosts. In summer, big brown bats emerge shortly after dusk to search for food. They feed primarily on beetles and moths, but also capture such insects such as flying ants, flies, mosquitoes, stonefiles, mayflies, grasshoppers and crickets. In towns, these bats fly over clearings, among scattered trees and around street or house lights that attract insects. 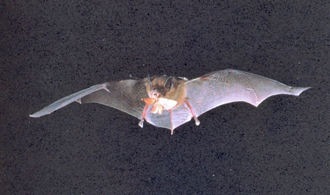 Big brown bats often feed on agricultural pests, including cucumber beetles (whose larvae are com rootworms), June beetles, green and brown stink bugs, and leafhoppers (Whitaker 1993). 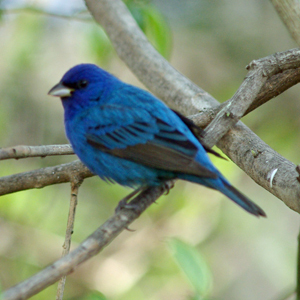 In winter, both sexes hibernate throughout the state in habitats similar to those used in summer. Most utilize the caves and mines of eastern Iowa, sometimes forming hibernating clusters of several hundred, e.g., Maquoketa Caves State Park. In caves and mines, individuals or small clusters may be near hibernating little brown and northern myotis and eastern pipistrelles. A few big brown bats hibernate in buildings and are the only bats to regularly do so in Iowa. The big brown bat is a hardy species and is active both in late fall and early spring, as well as on some warm days in winter. In hibernation, the body temperature may be only slightly above freezing, enabling this species to be in attics or more exposed parts of caves of mines. If air temperature of these roost sites drops below freezing, however, the bats will arouse and move to warmer locations. This is the reason that a big brown bat may appear in the living area of a house during very cold weather in mid-winter. The big brown bat is perhaps the only species of bat in Iowa that appears to have no problem surviving in the near future. While some colonies have been "controlled," many have survived human harassment and extermination attempts. Big brown bats are easily attracted to well-placed and properly constructed bat houses (Tuttle and Hensley 1993).